Cooking vegetables gratin-style is a delicious option–in the winter. Because a gratin is baked an hour or so, it’s tough to even think about making one in the heat of summer. Hence the slow cooker version in this recipe. Of course in cooler weather, you can also bake this dish at 350 (F) for an hour or so. Although kohlrabi has been at the markets lately, with the arrival of August’s hot temperatures, this cooler weather crop may disappear for a while. However, it frequently reappears in autumn, so keep this recipe handy. 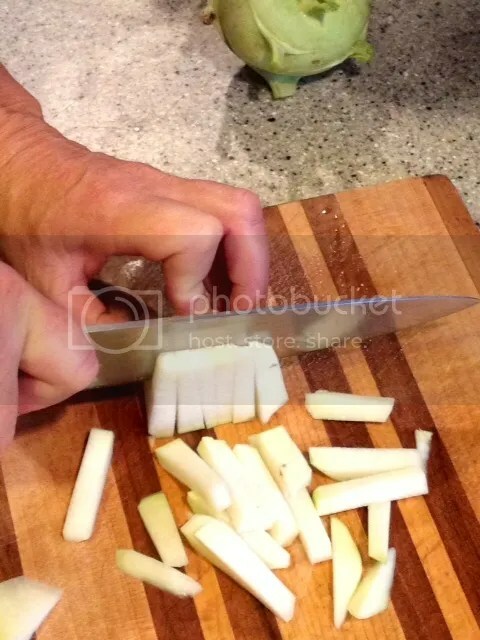 For tips on peeling and cutting a kohlrabi, see the next post. See the next post for instructions on quickly cutting matchsticks or, for a more traditional style gratin, quarter and slice kohlrabi thinly. Slow cook gratin a total of 6 to 8 hours as follows: Begin by covering slow cooker and cooking gratin on high for 2 to 3 hours until simmering vigorously, stirring occasionally. Once mixture is simmering well and kohlrabi has begun to soften, remove lid and continue cooking until most of liquid is evaporated–about 2 to 3 more hours, stirring occasionally. * Then reduce heat to low and re-cover with lid and continue cooking until vegetables are cooked to taste, about another 1 to 2 hours. In pan used for sauteing onions, melt butter over medium heat, then sprinkle crumbs evenly across bottom of pan. Cook, stirring every minute or two, until crumbs are lightly browned and crispy. About 30 minutes before serving, return slow cooker to high and sprinkle evenly with prepared crumbs. Continue cooking, uncovered, for the last 30 minutes. Serve with optional garnishes. * Note: cooking the dish uncovered allows moisture to evaporate, so the gratin comes out more like a baked dish than the kind of soupier dish that normal slow cooking produces. While this means this isn’t a dish to fix and forget all day, the result is well worth the small amount of extra attention required.